Lombardi’s on the Bay in Patchogue, NY offers one of Long Island’s best locations to capture a great wedding sunset picture. Whether on a day with deep cloud cover, like pictured here, or on a crystal clear summer night, this venue provides you and your guests with unparalleled views of the Great South Bay and Fire Island. Your cocktail hour and/or wedding ceremony can be hosted right here in the spot where this wedding photo was taken. Afterwards you and your guests will retire to one of the most beautiful ballrooms in Suffolk County, Long Island for your wedding reception. 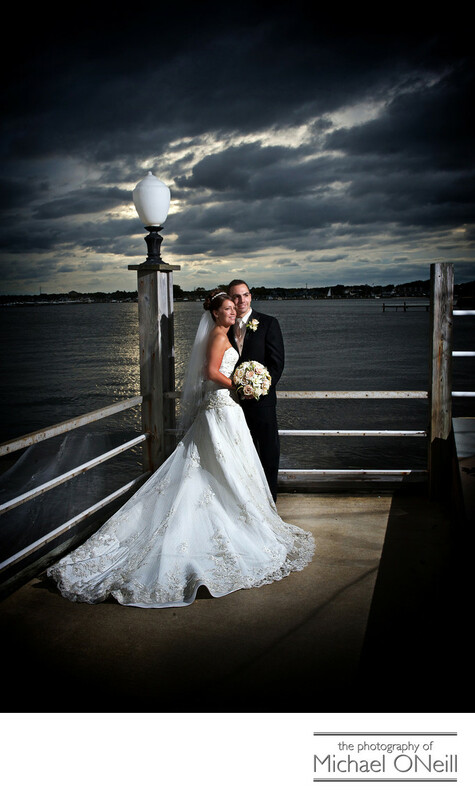 I have been working with the Lombardi family for more than twenty years and have a lot of experience working at all of their spectacular wedding reception venues: This one, as well as Villa Lombardi’s in Holbrook, NY and their other waterfront venue, Lombardi’s on the Sound in Port Jefferson, NY. If you are planning a Lombardi’s wedding give me a call. I’d love the opportunity to show you some of my extensive work at their establishments and talk about working with you on your upcoming wedding celebration.